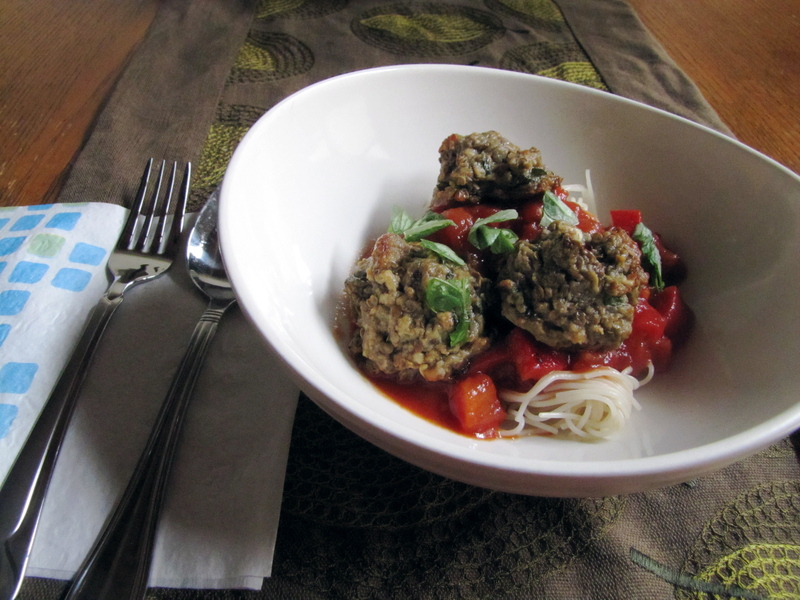 “On top of spaghetti, all covered with cheese, I lost my poor eggplant-meatball, when somebody sneezed…” Okay, so that extra syllable doesn’t quite fit the song but, songs aside, this vegetarian take on meatballs will certainly fit into your dinner schedule. They are tasty and substantial (for those wary-meatball skeptics), and satisfy that craving for homey, hearty Italian food. 1. Rub the halved eggplants with olive oil and sprinkle with salt and pepper. Place them on a baking sheet and roast for 25 to 30 minutes. Remove from the oven and let cool slightly. 2. Scoop out the flesh of the eggplants and place in a mixing bowl; mash the garlic and eggplant together, then stir in the breadcrumbs, Parmesan, egg yolks, basil, parsley and nutmeg. Add salt and pepper to taste. 3. Shape the eggplant mixture into golf ball-sized ‘meatballs’. Heat some olive oil in a pan and fry the balls in batches until golden, turning from time to time and taking care not to crowd the pan. Place on a paper towel to drain. (Alternatively, you can also bake them in the oven for about 15 minutes. 4. Serve with cooked pasta and sauce.